“One day, they’ll build a time machine, but no one will have the time to use it,” said George Carlin and he was right. Okay, maybe we haven’t made it to the time machine invention yet, but we certainly have to the ‘time’ part. A couple decades ago, the basic idea was a foundation of marketing and the creative concepts were born during brainstormings and Friday night parties. Digital marketing today is all about technologies. It is different, complex and continuously evolving. Nevertheless, for many of us, the term “marketing automation” still sounds a bit abstract. It’s like having a robot for running ad campaigns, social media management, blogging and sending email newsletters. Wait…email newsletters? What year is it? Indeed, the future of routine automation has arrived since the broad introduction of AI and machine learning. It’s hard to imagine any other professional sphere where the number of routine tasks would measure up with marketing. That’s why it’s time to start thinking about how exactly automation can help to elevate your business to a new level or turn your brand’s weaknesses into strengths. Does marketing automation automate marketing? Not really, but ask any marketer and it’s what they all dream of! Marketing automation is using a smart software that personalizes the brand’s message for your existing and potential customers based on customer data analysis performed by MA and AI algorithms. The main idea of marketing automation is to eliminate routine human labor, so that employees can focus on creative and complex intellectual work. Some entrepreneurs are still skeptical about MA, since they associate technical novelties with a waste of budget. On the other hand, the issue of “standardization” and adaptation of marketing technologies is a standard practice, which was adopted by large corporations a long time ago. Gradually, the market revealed that MA and AI integration is a gold mine that holds power to streamline promotion campaigns, increase conversion and loyalty, free up time, and alter the sales funnel. Today, when companies have realized this, medium and small-sized enterprises strive to adjust their marketing efforts to the modern automation systems that effectively deal with huge amounts of data. As the Walker Sands State of Marketing Technology 2018 states: Around 56% of marketing specialists think that the martech industry progresses far faster than their companies can keep up with. Brands that manage their leads using tools for marketing automation experience 10%+ revenue rate jump after 6-9 months. 49% of businesses use marketing tools for their email automation. 79% of renowned brands have used tools for marketing automation for over 3 years. 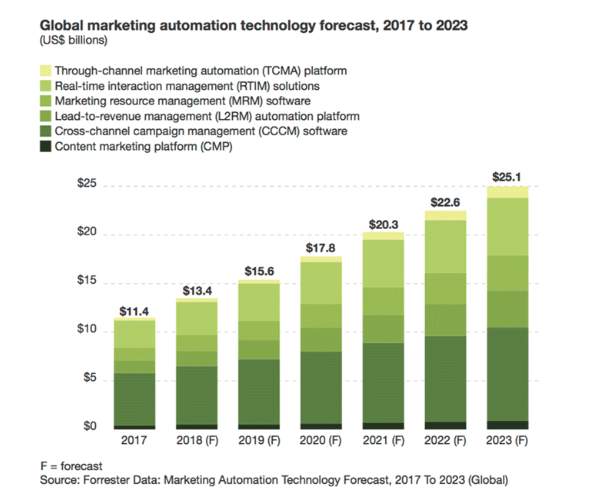 As you can see from the chart above, it is expected that by 2023, brands will spend $25.1 billion annually on marketing automation, and the majority of them intend to use it for cross-channel campaign management software. 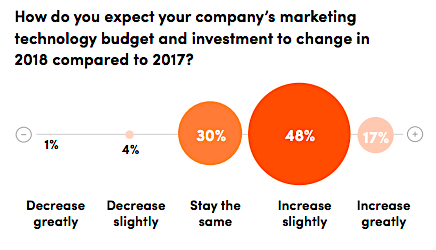 Walker Sands State of Marketing Technology 2018 points out that in 2019 around 65% of marketing companies will spend more on martech, while only 5% want to decrease this spending. The majority of CMOs are actively adjusting the annual funds that they plan to invest for innovations next year. 2019 will be the year of ‘marketing automation 2.0’. Companies will invest money like never before in AI and MA-powered marketing technologies. A lot of hype was devoted to these topics in 2017 and 2018, but this year will really further new discoveries. The marketing automation solutions based on MA and AI technologies will find new implementations in customer experience personalization. Considering that digital marketing has become more complex, the greater role has been given to communication schemes for mapping the customer experience. Development of such schemes allows you to determine the most relevant communication channels and the most successful interaction points on the customer’s journey from lead to payment. Companies that are operating in the areas of retail, tourism and finances have been using personalization for the user’s journey for a long time. There are a myriad of tools for personalization out there, starting from those integrated into commercial processes and ending with analytical systems and independent SaaS decisions. Optimization – Also known as A/B testing or multi-functional testing, Google Optimize, for instance, is designed exactly for this purpose. The testing reveals weak and strong points in the logic of your customer interaction path. Optimizing may identify the interaction scenarios that won’t work for your niche at all, and, most importantly, assess the the viability of marketing automation as a whole. Segmentation – Identification of the demographic groups into which you can divide your customers. Each cluster (segment) should be addressed with individual content to increase relevancy and conversion. Each group defined will demand a different approach and a fair amount of creativity to satisfy their personal interests. Individual (1:1) Personalization – Finding an individual approach to each client using MA and AI technologies. Customization is still the core, but this level helps to move beyond the boundary of the first two. 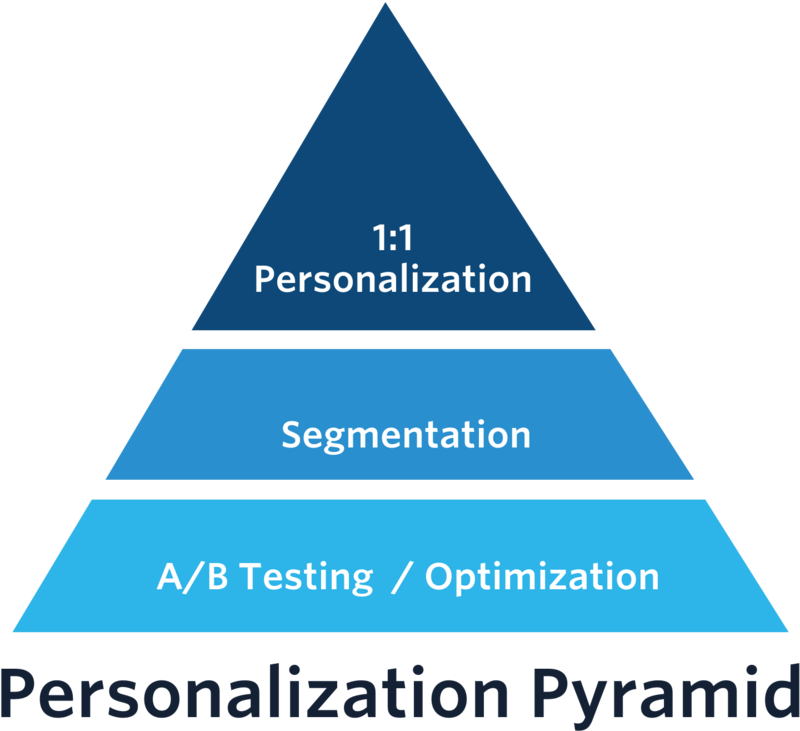 Personalization helps to scale up the results and reach every existing customer with an individual message. As we can see, eliminating manual labor was the main trend that AI brought in 2018. Along with this, we can also expect the mass personalization of web browsing experiences that was typically applied only for e-commerce websites back in 2015. Let’s take a peek now. 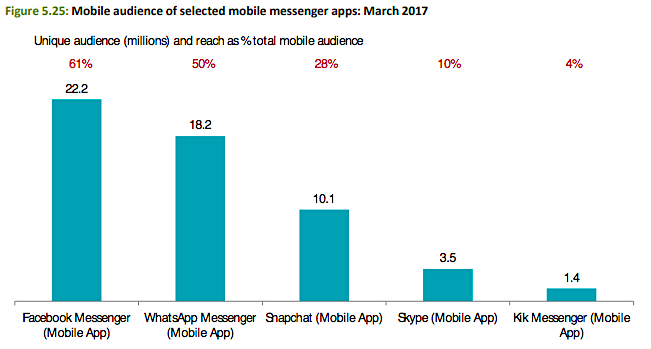 According to the Communications Market Report 2017, the WhatsApp messenger was used by half (50%) of the surveyed demographics, 61% used Facebook, and Snapchat was used by 28% of people. That represents 10.1 million unique visitors. And IKEA uses messengers and bots to enhance their customer satisfaction research. 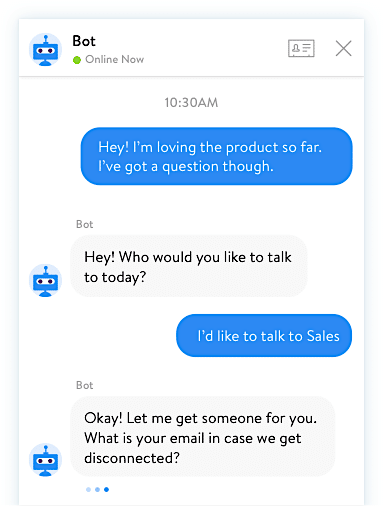 In 2018, companies paid specific attention to chatbots that could function around-the-clock and generate leads everywhere: desktop, in-app or mobile. Today, your email channel can work as an independent lead generation tool along with the website. 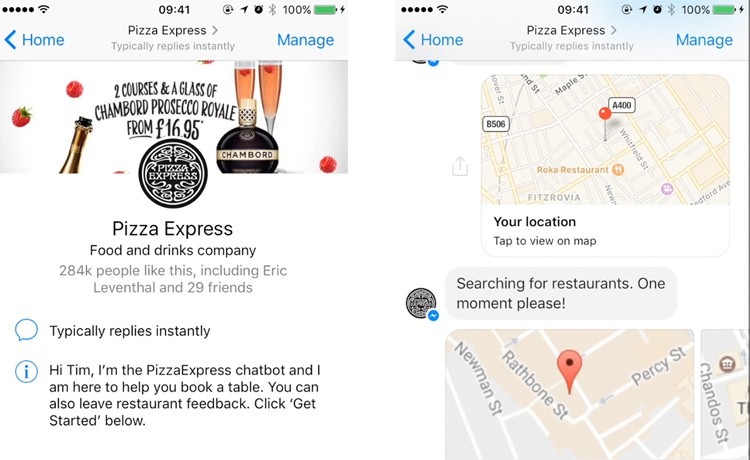 It can integrate a myriad of automation tools and effectively interact with chatbots and instant messengers. Search marketing is not new, and few innovations are happening currently in this area. The updates of the algorithms that result in radical search changes are rare compared to previous years when the web was affected by Penguin and Panda filters. Taking a glance at Moz’s algorithm change history in 2018, it’s hard to reveal the significant dynamics except for the “Fred” algorithm update. In spite of this, Google Ads, for instance, introduces new features quite often: If you recall, they had a solution for managing complex variables of display advertising – ‘Google Smart Display campaigns.’ This update featured automated bidding, automated targeting, and automated ad creation that introduced advertisers to immediate ad campaign creation enabled by AI and machine learning. What comes out of this? Content and search marketing are still on the verge of glory, and this glory is relatively stable. The integration of your search marketing in content marketing is not limited by search engine optimized articles. Your content marketing efforts can also be invested in end-to-end content mapping and ‘customer or buyer persona’ development. Using this approach, you can personify the content delivery. These statistics illustrate that many brands in 2018 were obviously losing marketing automation opportunities. 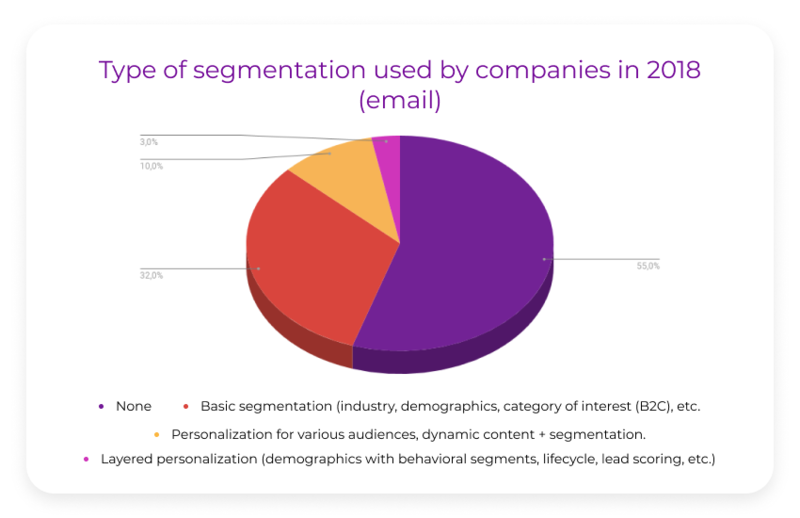 For the email channel, the use of machine learning makes it possible to automate targeting. However, such personalization is more complicated due to the nature of emails, which are more complex and creative. There are several ways to approach automation of email marketing from the appropriate angle. For this, you’ll have to select among CRM/email agencies, niche solutions or universal platforms for email campaigns automation, like MailChimp. Such services can detect the geolocation for each subscriber in your database. In the same way, you can tune individual design for each region, or even city, if you need it. In addition to segmentation by countries and regions, you can target the subscribers if they stay in the vicinity of a specific city or area. Using this email targeting method, advertising was run for many music celebrities during their world concert tours. The capabilities of machine learning are also impressive in the area of programmatic advertising and so-called Smart Bidding. According to Forrester, programmatic will prevail in digital ad spending in 2019 and by the end of 2023 will reach $25B, which is terrific in comparison to $11.4 billion in 2017. Most search-driven manual advertising campaigns (even those performed with professional tools) take into account three or four targets: the keyword, time of the day, and location. Such tools like programmatic demand-side platform can use hundreds of targeting signals to individualize the advertisement and even target according to lifestyle or behavior habits when integrated with customer data platforms. In order to develop a programmatic strategy, first of all, you should decide who your audience is and what you plan to achieve by addressing them directly. 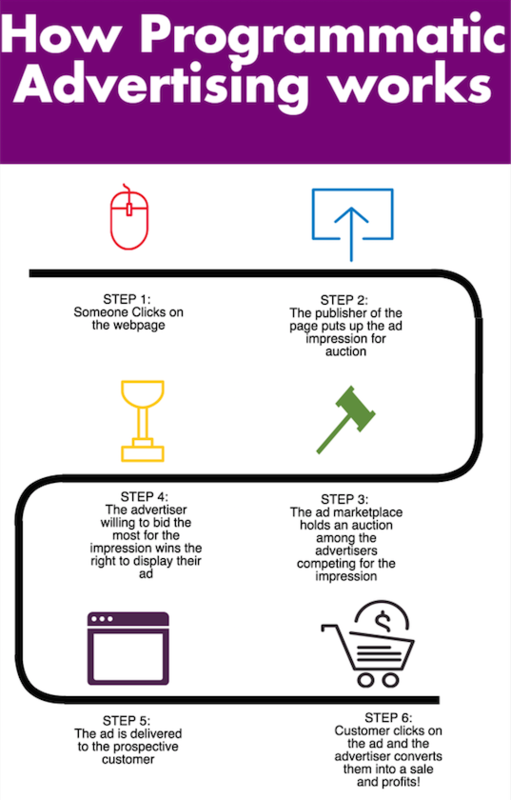 Programmatic advertising is not limited to a single goal and can be used to achieve different results. Even though programmatic delivers the highest conversions due to fine-tuned personalization, in fact, it can be used in every stage of the customer’s journey. In analytics and optimization, almost everything falls into the category of ‘repetitive routine tasks,’ and analytics is what helps marketers understand what works and what doesn’t. If you’re following the marketing trends, then you probably know that the modern marketing landscape might be lacking an essential component – a tool that would easily integrate and consolidate the data from various paid media. The good news is, these services exist but they’re frequently too expensive, especially if they offer additional analytical tools. 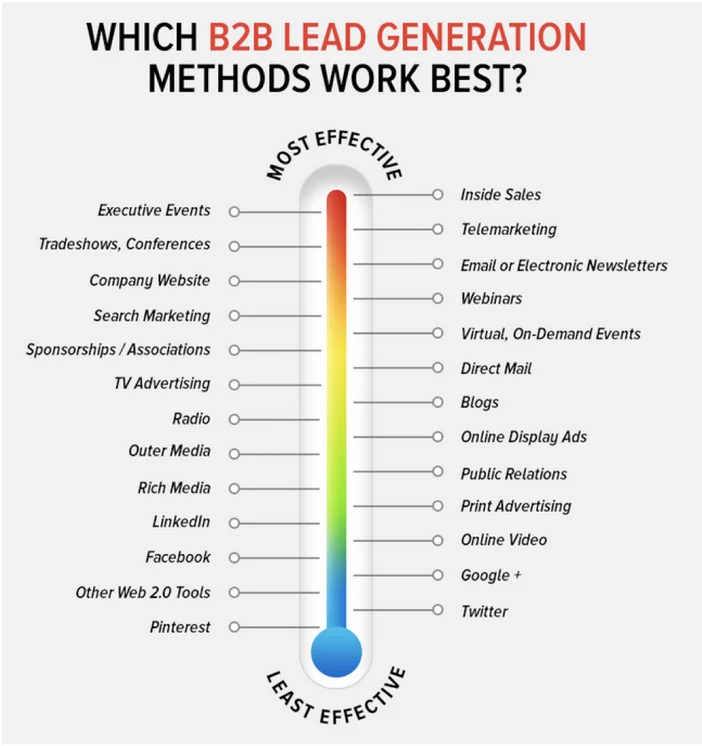 They are not marketing technologies that directly impact the number of leads or sales, considering that you also need to analyze this data and react to it appropriately. The analysis of the data sources in the shape it exists today will soon vanish. It will become AI-powered, automated, scaled, quick, intuitive, and visual. Do you want to be impressed? 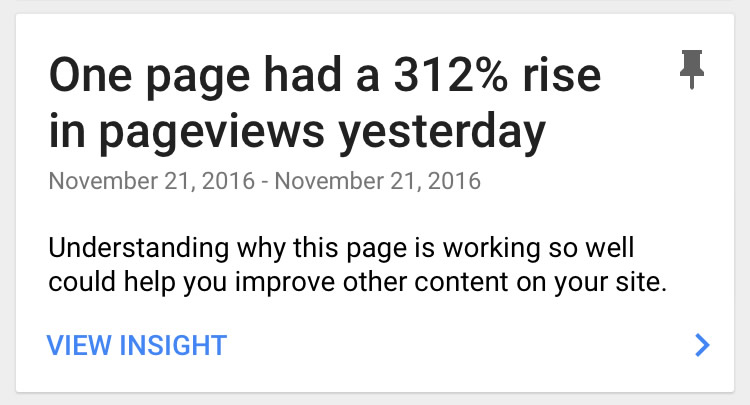 Then go to Google Analytics and click on ‘Assistant’ in the left navigation bar or on the Data-Driven Attribution. You will see a glimpse of the future of AI-based data analytics, even though it’s so far mostly manually operated. Marketing automation reduces the degree of uncertainty that marketing professionals have to deal with on a daily basis. As soon as your website traffic reaches a couple hundred visitors, you can’t possibly track each one manually. 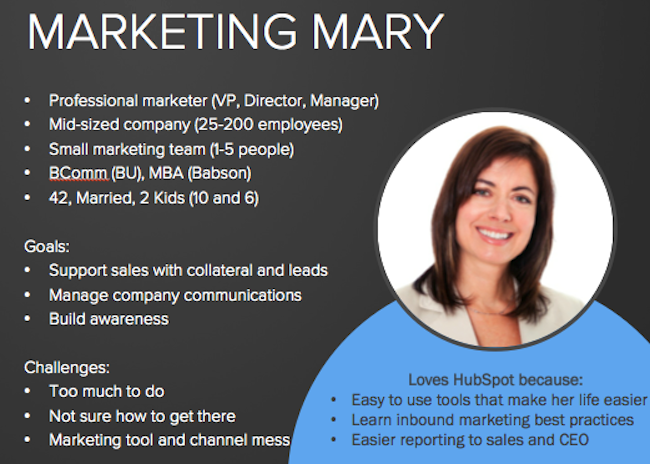 Here’s where marketing automation comes in handy. In the same way with emails, if you can’t send welcome letters to everyone who has registered or make offers based on their interests, use automation. Such decisions don’t only solve the problem with time-consuming daily routines, but also personalize and streamline the processes with user communications. Irina Kovalenko currently embraces the position of the Chief Marketing Officer at SmartyAds LLP. SmartyAds is a programmatic advertising software developer specializing in developing innovative programmatic software for ad buying and selling automatization. Irina’s professional experience is focused on the programmatic advertising but her background was formed by a multitude of disciplines, one of which is digital marketing.